01.07.02 : Par communiqué de presse du 01.07.02, le Maire de Santaliestra annonce que le 18 mai 2002, le Tribunal Suprême Espagnol a annulé la décision du 23 octobre 1998 prise par le Conseil des Ministres qui décrêtait l'urgence de l'expropriation et l'occupation des biens et des terrains nécessaires à la réalisation et au remplissage du barrage de Santaliestra. Cette décision avait été prise à la demande de l'Administration Hydraulique, sous prétexte d'analyses et de sondages géologiques et géotechniques sur les terrains affectés par le barrage. Le Tribunal Suprême, dont l'arrêt ne peut faire l'objet d'aucun appel, a jugé que l'Administration et le Conseil des Ministres "avaient inversé les termes", agissant comme si le barrage devait être construit avant de connaître les résultats des analyses et études préalables. 21.06.02 : The Greens/EFA call for a parliamentary delegation being sent to Spain to investigate the effects of the Spanish National Hydrological Plan on the environment. "The Petition's Committee should rapidly organise a fact finding delegation to visit the areas affected by the water plan. Only by going there, Parliamentarians will grasp the reality of a project, which completely disregards environmental sustainability. We cannot see the necessity to divert huge water masses to enable the construction of new golf courses in the south of Spain. An approval of this misguided project would give green light to similar non sustainable projects in other EU countries such as Italy." "The EU must not provide any funds for this project, which violates numerous EU directives. In February, the Parliament already sent a strong signal to the Commission asking by an overwhelming majority not to finance any water transfer projects in the Union. The 8 billion Euro the Spanish government hopes to get from Brussels for its megalomaniac project can really be put to better uses." 21.06.02 : Le groupe des Verts appelle à l'envoi d'une délégation parlementaire en Espagne pour évaluer les impacts du Plan Hydrologique National Espagnol sur l'environnement. "Le Comité de Pétitions devrait organiser rapidement une délégation pour visiter les zones affectées par le plan hydrologique. C'est seulement en y allant que les Parlementaires saisiront la réalité du projet, qui est en complet contresens avec la "soutenabilité" environnementale. Nous ne pouvons comprendre la nécessité de détourner des quantités d'eau énormes pour rendre possible la construction de nouveaux terrains de golf dans le sud de l'Espagne. L'approbation d'un projet aussi mal conçu donnerait le feu vert à des projets non-soutenables similaires dans d'autres pays européens, comme l'Italie." "L'Union Européenne ne doit pas accorder de subventions à ce projet, qui viole de nombreuses directives Européennes. En février, le Parlement a déjà lancé un signal fort à la Commission en demandant par une écrasante majorité de ne financer aucun projet de transfert d'eau dans l'Union. Les 8 milliards d'Euro que le Gouvernement Espagnol espère obtenir de Bruxelles pour son projet mégalomane peuvent vraiment être utilisés à de meilleures fins." 19.06.02 : Le Comité des Pétitions du Parlement Européens discute de 10 pétitions reçues au sujet du PHN, le jeudi 19 juin à 16h00 à Bruxelles. The European Parliament's Petitions Committee discuss 10 petitions on the PHN on Wednesday June 19 at 4 PM. N° 825/2001, présentée par Manel Tomás I Caubet, au nom de la "Coordinadora Antitransvasaments", et par Pedro Arrojo Agudo, au nom de la "Coordinadora de Afectados por Grandes Embalses y Trasvases"
N° 1077/2001, présentée par M. Abel Ferre. " Dam opponents in the Itoiz coordination group promised to appeal against the decision made public yesterday which they described as "scandalous, arbitrary and unprecedented in Spanish law". Though the case is under review by the European court of human rights and question-marks still hang over the dam's safety, the judgement may prove decisive in Spain's longest-running environmental dispute. Itoiz coordination group, tel: +34 948 226128; Audiencia Nacional, tel: +34 91 397 3399. BEIJING - More than 200 people have died in some of China's worst flooding in years, which has affected more than 30 million people and left vast areas under water, officials said yesterday. Some 210,000 people have been evacuated in one province alone, and homes and crops have been destroyed across the country after a week of rains. State media and officials said yesterday 205 people were known to have died, but scores are missing and officials fear the toll will rise. Questions sent by the European Commission to the Spanish Government about the NHP on the 23rd May 02. (Texto integral de las cuestiones enviadas por la Comision Europea al Gobierno espanol sobre el PHN, el 23 mayo 02). Villages have been flooded in northern Syria after a dam collapsed (Volume of the Reservoir 71 Million m3, built in 1996 on the Oronto River, ). The state-run Syrian Arab News Agency (Sana) reported widespread damage and heavy casualties around the Zeyzoun Dam, near the town of Hamah, about 350 kilometres (220 miles) north of Damascus. But government information officials later said they believed there were few people hurt or killed in the incident. Telephone lines in the area are down and details of what has happened remain unclear. BBC Middle East correspondent Paul Wood says Syria has been criticised in the past for minimising incidents that may reflect badly on the government. . The dam is in El-Alghab region, home to about 200,000 people, which mostly consisted of marshes until a series of dams was built. Monica Frassoni, Co-President of the Green/EFA Group has met today Commissioner Barnier to express him her concern about the Spanish Hydrological National Plan. During the informal conversation, Monica asked for careful assessment of the role of the structural and cohesion funds in financing water infrastructures. She also mentioned : the expectations arisen for tourism and intensive agriculture development, along the Mediterranean coast mainly, due to the announcement of the Ebro transfer (in particular, plans for new golf courses and fraudes with EU funds used for irrigation in Murcia); and possible alternatives to the plan. She also mentioned the simbolic paper of the plan as a test-case for the effective implementation of EU sustainable development policies. The European Commission has made no final decision about Spain's request for EU funding for its euros 18bn national hydrological plan and has written to the Spanish government requesting more information, environment commissioner Margot Wallström said on Saturday. Speaking at the weekend's meeting of EU environment ministers on Mallorca (see separate article, this issue), Ms Wallström said that after "studying very carefully all the documents received" the Commission had requested additional information from the Spanish environment ministry. 26.05.02: Collaboration on the management of polesie wetlands in Belarus, Poland, and Ukraine. For millions of years Lake Baikal has remained a deep-water repository of relic fauna and pure fresh water, although its basin is constantly being filled up with the alluvion brought by violent landslides, slide-rocks, mudflows and rapid tributaries. Obviously, to keep the balance the basin should extend at least by the volume of delivered sedimentary. Doctor Boris Agafonov from the Institute of the Earth`s Crust has made calculations and proved that the volume of the incoming alluvion is four times less than that of the increment of the basin, the latter extending due to the internal earth`s crust processes. After the international protest camp organised by our collective, which constituted a real success in it's participation, these are the latest reports in relation to this project: -Actions which took place on Oct 31 and Nov 1 for the release of Iñaki Garcia Koch and a halt to the dam project. As you know Iñaki Garcia Koch is one of the 8 members of our collective who cut concrete supply cables at the dam works, was arrested in a routine police control in June last year. He is currently serving a 4 year 10 month sentence in the prison of Iruña/Pamplona. To demand his release and a halt to the dam project various actions of protest took place in different parts of the Basque Country and the Spanish state. In the 4 provincial capitals of the Basque Country: Iruña (4 arrests) , Bilbo, Gasteiz, and Donostia various people chained themselves to the interior of different public # In the Spanish state there were numerous actions of protest in Granada (one protester was detained and accused of being a terrorist sympathiser) , Castellon (protest heavily suppressed by police) , Zaragoza, Madrid, Barcelona, Leganes, and Badalona. In all these actions other hydrological projects and the entire "Plan Hidrologico Nacional" were also denounced. On these dates the action of simultaneously sending faxes to the director of the Itoiz dam project also took place and signatures are still being collected for a manifesto supporting the release of Iñaki. If you wish to express your solidarity and support to Iñaki you can write to him in prison in Iruña at the following address: Iñaki Garcia Koch, Carcel de Iruña, C/San Roque s/n, 31011 Iruñea Basque Country. -Action of Solidarios with Itoiz at the stone laying ceremony of the canal of Navarra. 3 members of our collective disrupted the official stone laying ceremony to inaugurate the building of the "Canal de Navarra " when they arrived naked and interrupted the actual stone laying. Despite the very high security the 3 managed to arrive cross-country to within meters of the Spanish Environment Minister and the president of Navarra. They were arrested and later released. This 177Km canal beginning at Itoiz, with an estimated cost of 625 million Euros is in theory for the irrigation of 53,000 hectares in lands in the south of Navarra (La Ribera). We say in theory because, we believe that in practise the canal in it's entirety will never actually be completed, that the true objective of the construction of the Itoiz reservoir and other reservoir projects in the Ebro valley (Cuenca del Ebro) is the immense program of waterways designed in the "Plan Hidrologico Nacional" to carry huge quantities of water to Catalonia and the Mediteranian coast. Favouring the interests of industry, development, tourism and intensive farming. This canal will be nothing more than another ecological and economical fiasco within the senselessness of everything relating to the project of Itoiz. -Demonstration of over 300,000 people in Barcelona to demand the scrapping of the National hydrological plan (Plan hidrologico Nacional). On the day before the summit of European leaders in Barcelona there was one of the largest demonstrations against this insane project, which will result in the building of nearly 200 new reservoirs (in the country with the highest number of reservoirs per square Km per habitant in the world) with a vast network of waterways. If it goes ahead it will result in the ecological destruction of unexpected consequences greatly worsening the environmental unbalances which already exist. Delays of 1 year in commencing the filling of the Itoiz reservoir. Both the environment minister and the Navarran government had announced the beginning of trial filling of the reservoir for spring last year, but something in their calculations was wrong. Not only have they not filled it, but they have announced more delays taking the date to the end of this present year. The reason for these long delays is no other than the fear of an incalculable catastrophe resulting from the filling of the reservoir. The 2 independent engineers of recognised prestige, Arturo Rebollo and Antonio Casas, warned more than a year ago of the geological instability of the area in which the dam has been constructed. Predicting the possibility of 7 different risks of a disaster if it is filled, resulting in the death of thousands of people living near the waters not only below but above the dam. As if this is not enough, there are also serious doubts to the resistance of the foundations of the Asco Nuclear plant (situated on the banks of the river Ebro) to flood waters in the event of the dam overflowing. Up till now the authorities have ignored the engineers report, even ridiculed it. The Emergency Program approved by the Spanish government is based principally on the report. The said program contemplates the possibility of catastrophes similar to those described by A. Rebollo and A. Casas, putting in danger the lives of 66,000 people in Navarra and tens of thousands in Aragon including the residents of Zaragoza, not counting the millions of people who could be affected by the consequences of the dams possible overflow on the Asco nuclear plant. This emergency plan doesn't even include measures for the evacuation of the people (in many cases impossible) it is limited to warning the population with the use of sirens! -13th April 2002 Demonstration in Iruña/Pamplona: "NO TO THE FILLING OF ITOIZ RESERVOIR, FREE IÑAKI"
SILVER CITY, New Mexico, May 17, 2002 (ENS) - The Rio Grande, the river dividing the United States from Mexico, no longer reaches the Gulf of Mexico into which it has emptied for millions of years. The water has stopped flowing due to a sandbar formed by several years of low water levels plus high water usage in drought stricken northern Mexico. 13.05.02 : A new Blue Marche and a Demonstration against P.H.N., in the Majorca Island during the European Summit of Environment Ministers, from 24 to 26 May 2002. The Platform in Defence of the River Ebro is organising (together with the Platform for Democracy and a Social Globalisation) a demonstration in Palma , Mallorca on the 25th at 19.00. This demonstration coincides with the EU Environmneta Ministers' Summit in Mallorca and is for a new environmental outlook and will focus on the chief environmental problem in Spain - the National Hydrological Plan. During all the 25th there will be different activities and conferences about the NHP problem. From the 22nd to the 24th there will be a Blue March across the island. This is a natural follow-on from the Blue March to Brussels, asking the EU to support a sustainable future and carry out its own policies. In each town we will be met by local representatives and on the 24th by the President of the Balearic autonomous government. Most of the meals, transport on the island, and accommodation will be provided (you will need a sleeping bag!). The only significant expense will be the boat to Mallorca. It will leave Barcelona on Tuesday 21st 23.00 arriving 22nd 6.00. The return trip seems to be Sunday 26th 23.00, arriving 27th 6.00. This costs about 60 euros. Obviously you can go and return from the island in any other transport or timetable you prefer, but the main group from the Ebro Delta will take this boat. For more details, or to register, phone Loli on 0034 607 953 223 (Spanish) or mail Susanna at miuli@wanadoo.es (any language). Finally for those of you who have participated in earlier Blue Marches, you will need no encouragement, but for others we would insist that this is a once-in-a-lifetime experience, lots of work, lots of pleasure, and, yes, we can change things - a new world is possible! 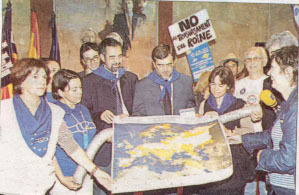 13.05.02 : Marche Bleue et Manifestation contre le P.H.N., dans l'île de Majorque à l'occasion du sommet européen des Ministres de l'Environnement, du 24 au 26 mai 2002. A l'occasion du sommet européen des Ministres de l'Environnement à Majorque, la Plateforme de Défense de l'Ebre organise une manifestation, conjointement avec la Plateforme pour la Démocratie et la Globalisation Sociale, prévue pour le samedi 25 mai. Avant cette manifestation, une Marche Bleue parcourra l'île de Majorque du 22 au 24 mai. A Palma, la Marche Bleue sera reçue par le Président du Gouvernement Baléare et La Conseillère de l'Environnement. La Marche se fera en minibus et/ou fourgonnettes. Quand cela sera possible, les étapes se feront à pied ou bicyclette. Les participants doivent emmener des sacs de couchage et des isolants, ainsi que des sacs à dos très faciles à transporter. Le départ de la Marche Bleue jusqu'à Majorque aura lieu le mardi soir 22 mai à 23h00 et l'arrivée à Palma à 06h00. Le retour reste à déterminer, mais se fera durant le dimanche 26. Les allers et retours de Barcelone depuis les lieux d'origine restent à déterminer, ainsi que les prix. This conference will promote well-informed international debate about what the next quarter century might hold in store for all the water-based ecosystems of the earth. Directly following the World Day for Water in the International Year of Freshwater the 5th ICEF will assess threats to resilience and likely changes in the 21 major aquatic systems over a time horizon of the next 25 years. For this purpose, FEC and EAWAG have engaged leading scientists from around the world to review each of the major marine and freshwater systems. The 5th ICEF will offer environmental managers and opinion-formers a unique and objective basis for environmental strategy formulation at regional and global levels. Source : Le Moniteur Date de parution : 3 mai 2002 Th�me : Transport Dans sa rubrique �Confidentiel�, Le Moniteur r�v�le que quinze s�nateurs de tous bords r�fl�chissent � relancer sur de nouvelles bases le dossier du canal Rhin-Rh�ne. Le pr�c�dent projet r�pondait aux exigences de convois pouss�s de 190 m�tres de long, alors qu�ils ne repr�sentent que 4% du trafic au nord de Strasbourg. Le nouveau projet permettrait le passage d�automoteurs de 130 m�tres, ce qui r�duirait l�impact de l�infrastructure sur les m�andres du Doubs. Le groupe pr�voit d�achever ses auditions en juin pour pr�senter un rapport � la rentr�e. NUKUS, Uzbekistan, April 30, 2002 (ENS) - Russia is not expected to approve an Uzbek plan to divert water from Siberia to the cotton fields of the Central Asian state, where drought and a population surge threaten the entire region with catastrophe. (ENS) - The U.S. Army Corps of Engineers has suspended a dredging project on the Delaware River after a Congressional review raised questions regarding whether the project is financially justified. Conservation groups, who have opposed the project for almost a decade, called the decision a "victory for common sense conservation." Spain's supreme court last week threw out an appeal by the Navarre regional government against its 1997 order enforcing protection of three designated nature reserves. The ruling puts another obstacle in the way of efforts to start filling the controversial Itoiz reservoir. Navarre continues to defend the project's legality. Spokesperson Nuria Iturriagagoitia insisted yesterday that Spain's constitutional court would have the final word in the complicated 11-year legal battle over the project. In a ruling issued two years ago, this court backed the dam's construction (ED 15/03/00 ). Despite repeated legal setbacks and question marks over safety, work has continued on both the now-completed dam and accompanying irrigation canal at an estimated cost to date of euros 200-300m. However, the reservoir remains empty despite repeated official assurances that filling will go ahead (ED 27/09/01). The dam is required in a non-explicit way to make the Ebro transfer (main bulk of the Spanish National Hydrological Plan) possible. The "official" objectives of the dam are to supply water to Pamplona and to establish new irrigation in Navarra. "Unofficially", it will be used to ensure a sufficient volume of water in the Ebro so the required water (the infamous 1050 hm3) can be transferred. Complaints to the European Commmission, both in the past and now, have not resolved favorably for nature conservation, but last week's Spanish Supreme Court decision could make the difference. ACCRA, Ghana - African and U.N. leaders opened an international conference on water and sustainable development on Monday, urging effective management across borders to solve Africa's poverty-perpetuating water shortages. Speakers at the conference - including Crown Prince Willem-Alexander of the Netherlands, U.N. Secretary-General Kofi Annan's adviser on water - linked poverty in most developing countries, especially in Africa, to the water crisis. "The 40 worst water-famished countries in the world, in many of which people live on just two gallons a day for all uses, can never escape poverty and achieve sustainable development without first addressing their water scarcity," the prince said in his opening statement. Pointing to countries where "poverty and lack of water is inextricably linked," he cited Gambia, Djibouti, Somalia, Mali, Mozambique, Uganda, Ethiopia, and Eritrea. Among countries beyond Africa, he listed Cambodia, Bhutan, and Haiti. Two hundred delegates, including several African cabinet ministers, are attending the conference - a prelude to the World Summit for Sustainable Development opening in Johannesburg, South Africa, this August. The three-day conference in Accra, the capital of Ghana, was organized by the Dutch government under sponsorship of the African Development Bank Group. The focus of the conference is proposals by Willem-Alexander and others in the United Nations on increasing awareness on the gravity of inadequate supplies of water and on solving the problems. Willem-Alexander set targets of halving the number of people without safe drinking water by 2015 and of making more effective use of water in agriculture without increasing the amount diverted for it. More than 1 billion people worldwide lack safe drinking water, the crown prince said, and more than 2 million die each year from water-related diseases. "The water crisis is especially acute in Africa, where only about 60 percent of the 680 million people have access to safe water supplies," he said. People in the worst-off 50 countries, at least half of them in Africa, are forced to get by on 30 liters or less per day for farming, cleaning, and all other needs. That's well under than the 50 liters per day that the United Nations says constitutes the absolute minimum. Opening the conference, Ghanaian President John Agyekum Kufuor mourned the fact that Africans lacked adequate safe water despite the "mighty rivers" of the Nile, the Congo, the Limpopo, and the Volta as well as the Great Lakes. Kufuor encouraged partnerships to attract investment in water to reduce the burden on individual countries' economies. Also attending the conference is the former secretary-general of the Organization of African Unity, Salim Ahmed Salim, named water ambassador for Africa. Salim is expected to work out guidelines on protection of Africa's water resources based on suggestions from the conference. SHANGHAI, China - China's Three Gorges Dam, the world's largest hydroelectric project, will create a reservoir massive enough to raise temperatures and force crop changes in nearby areas, a government meteorologist predicted Wednesday. Zhu Changhan, a researcher at the China Meteorological Administration, said temperatures around the reservoir site in central China could rise by an average of 1 degree after the dam's completion in 2009. Computer simulations show the 400-mile-long body of water will be big enough and change the terrain enough to alter wind patterns, increase humidity, and reflect more sunlight, Zhu said. He said this will produce hotter weather in areas up to 60 miles from the reservoir, which will fill part of the Yangtze River valley in the regions of Chongqing and Hubei. Though small, the rise in temperatures will be enough to force farmers to abandon some of the crops currently grown in the mountainous region, particularly fruit like mandarin oranges, Zhu said. 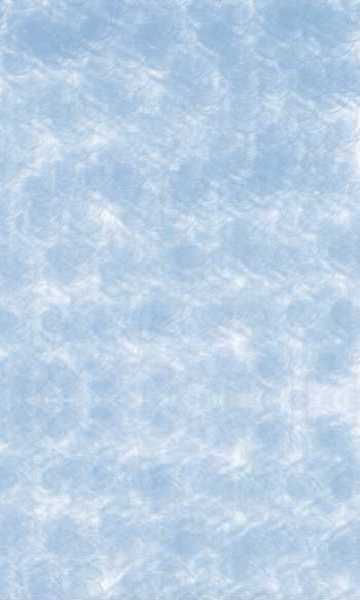 He said the temperature increase could be even higher in some areas. "The rise in water levels will certainly bring changes. And those changes can't be reversed," Zhu said by telephone from his office in Beijing. He said the ecosystem in the region's forests and other undeveloped areas will probably prove more resilient and not be significantly affected. The higher temperatures may also help local farmers by bringing increased rainfalls, he said. The China Meteorological Administration, the national weather bureau, will make more detailed simulations as measurements continue to be taken until the 2009 completion date, Zhu said. Environmental impact is just one of many controversies surrounding the $25 billion dam project, which the government bills as necessary for central China's development. More than 1.13 million people are being relocated, and experts have raised concerns about pollution and the stability of bedrock below the dam site. The reservoir will be filled by stages starting in June of next year. THE concept of constructing sweeping electricity highways across Africa, lighting up the continent, has long been a cherished ideal of politicians and engineers. Transporting power between SA and Spain is not only a fascinating notion, it also holds out real economic benefits for Africa. And it is possible. Only two proper regional grids in the north and south of Africa have been established to date, but there are just a few gaps in the existing continental electricity grid which would need to be linked up to make the dream a reality. Many argue that the growth of Africa's power supply will underpin the continent's future development. In addition, Africa is rich in hydroelectricity sites, providing big opportunities for clean power. The continent possesses 17% of the world's hydroelectric capacity, of which less than 6% has been developed. Only in Egypt is hydropower tapped to a significant degree. The Democratic Republic of Congo, in particular, has great untapped potential. A site on the Congo River in the Congo, called Grand Inga, has the potential to generate 39000MW of power - enough for most of Africa - if it is harnessed. But do we need this amount of electricity? In the long term - say 20 or 30 years - it is possible there will be enough demand to warrant the kind of investment required to link up the grid. At the moment, however, Africa has very low electricity consumption by world standards. The World Energy Council says Africa currently has 13% of the world's population, but accounts for only 2% of its gross domestic product (GDP). In creating this 2% of the world's GDP, it consumes 3% of its commercial energy, although its share of world commercial energy production is 7%. So while the provision of electricity is a proven driver of economic growth, transporting power thousands of kilometres across Africa and to Europe is expensive. It can only be economically justified if there is high demand and cheap sources of power. Most utilities do not have the funds to build regional networks, which means the private sector will have to step in. They are unlikely to do so until they see significantly improved returns, or perhaps until the liberalisation of Africa's power market begins to show real progress. A presentation delivered at the recent sub-Saharan Power Conference by Eskom's Dolly Mokgatle, focusing on the possibilities of taking the energy grid across Africa, concludes that in the short term, it may be more practical to build an African grid a piece at a time. In other words, interconnect each African country with its adjacent neighbours first, and then consider a grid spanning the continent "This is what the Southern African Power Pool intends to achieve within the next decade," says Mokgatle. The pool was created in 1995 when 12 countries in the southern half of Africa decided to pool their electricity supply resources. These included SA, Tanzania, Angola, Zambia, Malawi, Zimbabwe, Mozambique and Congo. The main goal of the pool is to co-ordinate electricity activities across these countries, with benefits including the reduction of fuel costs and the ability to help countries if they run short of power. The pool also runs a short-term energy market which allows for exchange of surplus power at a low price. Mokgatle says there are a limited number of regional grids - either up and running or being formed - with only the northern and southern African regions having significantly integrated their networks. In southern Africa, nine out of 12 countries in the region are interconnected; in North Africa, five out of six countries are interconnected; and seven out of 12 West African countries are linked. Only two in five countries in Central Africa are connected and two in10 in East Africa. "In practice, over the next 20 years, only the North African and southern African regions can ... justify (the construction of) long inter-regional connections," she says. Two other issues will influence the building of interregional power grids, namely Africa's future energy mix, and progress made on the liberalisation of electricity markets. Jan Murray, deputy secretary-general of the World Energy Council, says the outstanding feature of Africa's energy mix is an overwhelming dependence on the traditional fuels of wood, charcoal, dung and crop residue. They account for about two-thirds of energy consumption, with wood by far the dominant source. Murray says it is critical to provide access to modern energy services. This means harnessing natural gas, hydro-electricity, coal and to a lesser extent, nuclear power. Big money is needed to build the plants and transmission systems to convert these different forms of energy into power which can be delivered to people. Given the financial constraints of many regional utilities and governments, the private sector will have to be persuaded to come to the party. This will require market reform. World Bank studies show that to date, Africa has lagged behind other regions in reforming the power sector, except for concessioning of utility management to private operators in some Francophone nations. However, the bank also found many African nations are looking at moves to liberalise their power sectors, to be backed by plans to form regional power pools. These will help make up for the small national power markets, says the bank. While the chances of SA being able to trade electricity with Spain are unlikely to come to fruition anytime soon, this is an uplifting vision for the future. It will have to be underpinned by market reform to facilitate big investment, which in turn will require peaceful countries with stable governments. Then the dream can become a reality. Chalmers is Associate Editor. 10.04.02: Young Student Summer School "Reservoir Water Quality Modelling And Management"
modelling. It is possible to attend only the course. For more information visit http://www.hbu.cas.cz/ResLim2002 or contact Josef Hejzlar, Ph.D., Hydrobiological Institute, Academy of Sciences of the Czech Republic, hejzlar@hbu.cas.cz.